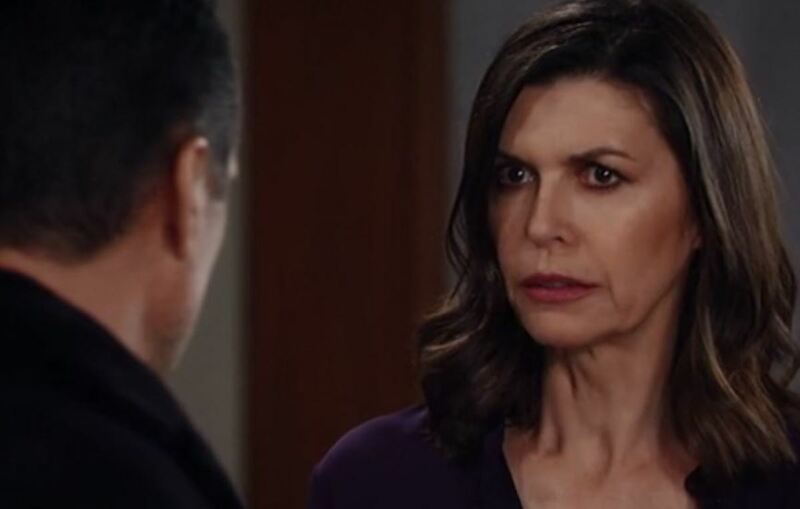 Perkie's Observations: Can Sonny do what Anna Can't on General Hospital? Jason runs into the Corinthos clan and tells them that he&apos;ll be moving out of the hotel and into his own place. He thanks Sonny for surprising the gunman at the wedding and saving Sam and the others. After Sonny leaves, Carly mentions that Jason could have taken on the gunman as well. Jason says he doesn&apos;t want to work for Sonny anymore, which Carly is grateful for. Anna questions whether Paul has heard from Carlos, but he denies having spoken with him. Anna is curious as to why Paul is helping her. He claims he cares about her, as Griffin watches them from a distance. Dr. Mays tells Monica that Tracy hasn&apos;t shown up for her biopsy. Tracy heads to the family crypt to talk to Quartermaines. She says she&apos;s not ready to die, but admits that she&apos;s scared. Dillon finds her there. Tracy seems confused and has another seizure. Felix runs into Griffin and the two commiserate about how awful Dr. Mays is. Felix tells him to go to Monica if he has any concerns. Griffin speaks with Monica and asks to see Tracy&apos;s MRI results. Carly admits to Jason that Sonny&apos;s business is violent and that it&apos;s not acceptable anymore. She says Sonny agreed to be less aggressive. Carly claims there are worse people than Sonny and that he can do things that cops can&apos;t. Talk turns to the Quartermaines. Carly mentions the family crypt which Jason wants to see. Sonny shows up at Anna&apos;s to thank her for taking down the gun operation. Anna counters that she appreciates that he helped stop Dixon and that they have a mutual respect thanks to Robin. When Anna leaves the room Sonny spots a photo of Carlos and Sabrina that Robert just sent to Anna. Sonny questions the validity of the photo. Anna says Carlos is alive and last seen in Belgium. Sonny wonders who&apos;s been protecting Carlos and promises to hunt him down and kill him. Paul calls Carlos and tells him that he&apos;s no longer safe and needs to come back to Port Charles. Carlos says he&apos;s free and has no intention of returning. Paul points out that life on the run isn&apos;t fun and says he wants Carlos to testify against Julian for immunity. Carlos has no interest in a new deal and says he&apos;s never coming back. Dillon takes Tracy to the hospital and asks Griffin what&apos;s causing the seizures. Dr Mays interrupts and mentions the word cancer which worries Dillon. Dillon heads off to get reassurances from Monica. Griffin accuses Dr Mays of misleading the family. Griffin feels it may not be cancer because Tracy recently travelled , but Mays shuts him down. Felix shows Michael a photo of Sabrina&apos;s baby and says she sent it to him with a letter saying she&apos;s happy and not returning. Anna tells Sonny that she wants Carlos alive, to testify against Julian. She knows Sonny has resources that she doesn&apos;t. (Seriously show? She has the WSB and Robert Freakin&apos; Scorpio at her disposal, but idiot Sonny will find him?). Sonny agrees that Duke deserves justice and the two agree to keep each other informed. Carly and Jason check out the crypt. Carly tells him about his family and how they hated her for being trailer trash. Carly doesn&apos;t want him to run back to the Qs, just to get away from Sonny. Jason says he won&apos;t be moving backwards. Jason wants the plaque with his name removed, which he does. He tells Carly that he wants to spend time in the crypt. Michael tells Sonny about the picture of Sabrina&apos;s baby and feels badly that she left because of him. Sonny feels he needs to tell Michael the truth. Monica explains to Tracy and Dillon that the biopsy is a minor procedure, which will give them more information. Dillon wants to call Ned, but Tracy tells him not to. Dillon wants to speak to Griffin about his theory. Griffin shows up at Anna&apos;s door and tells her that he&apos;s been following her.